Your skin takes a beating during the winter months. Regardless of how cold it actually gets where you live, cooler temperatures and windier weather mean drier air. Exposed skin is especially vulnerable and extra care should be taken to prevent dry patches that can become itchy and irritated. Combating winter skin means taking an entirely different skin care approach than during the spring or summer. As skin loses moisture it loses some of its firmness, which allows wrinkles to take hold, especially overnight. Hydration, both internally and externally, is necessary to keep skin glowing and healthy. While your body does not lose water and electrolytes as quickly during the winter months because the sun isn’t causing you to sweat, it’s still important to replenish fluids. Aside from sweating, our bodies lose water daily through breathing and urine production. Without enough water, major organs like the kidneys and the skin won’t function properly. Besides drinking enough water, consuming foods with omega-3 fatty acids will also maintain hydration within the body. Fish, nuts, seeds, soybeans and dark leafy greens have the highest concentration of omega-3s. Fatty acids repair cells and aid cell growth within the body in addition to having anti-inflammatory properties. Fish oil and flaxseed oil in particular are extremely effective because of their vitamin E content. Vitamin E can protect against the absorption of toxins and helps give skin that healthy glow. It’s also effective for healing windburn and chapped lips or skin when applied topically. Using a humidifier can also help combat dry winter air indoors. Dry heat dehydrates the skin and can also irritate the airways. Humidifiers add moisture back to the air, which the skin can then absorb. Aside from the skin, humidifiers will also help with dry lips, nose and throat and help prevent colds. Taking warm showers can also add moisture back to the air and your skin. Just make sure the water isn’t too hot because hot water will only dry out the skin more. When you shower, use a moisturizing body wash that will keep the moisture in and leave skin soft and smooth. Stay away from bar soaps as these often have a higher pH, which strips the natural fatty acids and oils from your skin. Skip the bathroom heater if you have one, and air-dry instead to prevent further dehydration of the skin. To aid winter skin directly, the dry flaky dead layers need to be exfoliated away. It’s best to use a homemade exfoliator using sugar or sea salt or a store bought one with natural ingredients. Too many chemicals and alcohols can make the dryness worse or cause irritation and allergic reactions. Make sure to cleanse the skin first, otherwise dirt and other particles will just get pushed around, further contributing to redness and irritation. The best way to combat dry skin, however, is by adding moisture back to the skin directly. Moisturizers are important for skin care year-round, but absolutely necessary when it’s cold outside. For the face, creams with natural oils like avocado, rosehip or almond work best. These types of oils won’t leave skin feeling greasy, even if your skin is naturally oily. Look for moisturizers with alpha hydroxy acids as well; they will attract moisture and preserve the skin’s elasticity. When looking for moisturizing body lotions, choose body butter or lotions with a thicker consistency that will provide an extra layer against the elements. Smooth lotion on directly after a shower for better absorption that will last throughout the day. Pay extra attention to skin at the joints, which are more likely to dry out from movement and overuse. Exfoliating with a pumice stone before moisturizing will also smooth out rough patches and leave skin feeling soft and healthy. Some of the thinnest skin on your body is the back of the hands and tops of the feet. Gloves or mittens should be worn when outdoors to protect hands from drying out. Choose a pair with a soft inner lining like fur or fleece, which won’t irritate the skin. Avoid pantyhose during the cold months as well. Nylon doesn’t allow skin to breathe, causing redness and flakiness from rubbing together. The hands and feet are also the areas most likely to dry out and show signs of aging. Exposing them to the cold air, using harsh dish soaps, and constant hand washing can contribute to dryness and irritation. 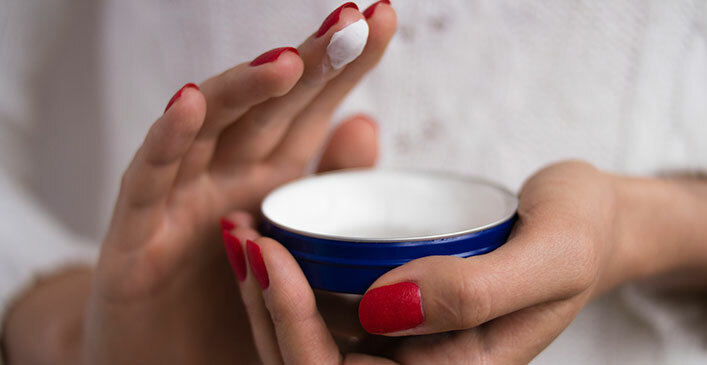 Regular body lotion is not enough for moisturizing the hands and feet; thick creams and gels are needed to act like a second layer of skin for added protection. To maximize their effect, wear cotton gloves or socks to bed after moisturizing, which will allow for the nutrients to absorb through the hands and not evaporate overnight. If none of these solutions seem to help, talk to your doctor. They may refer you to a dermatologist who can determine whether you need prescription-strength creams or salves. You may also be evaluated for skin conditions like eczema or psoriasis, which may require alternative treatments to clear up.